Post Ebola: Consequences for Sierra Leone and its development. 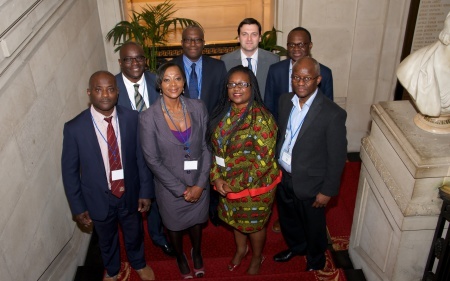 The evening welcomed a number of high profile engineering professionals from Sierra Leone, including the Deputy High Commissioner of Sierra Leone to the United Kingdom, His Excellency Tamba Mansa Ngegba, and Professor Kosonike Koso-Thomas, the evening’s Keynote Speaker. In addition, we were honoured to have speakers from the US and the UK. All speakers delivered a highly interesting and thought-provoking array of speeches on the subject and we hope to make some of the presentations available shortly. These were followed by a panel discussion and questions from the guests ending with an introduction about Engineers for Change, Sierra Leone and its vision and plans, from one of the charity’s trustees. The whole evening was chaired by CEC President Professor Paul Jowitt and we are very grateful to him for his efforts. The evening’s agenda, Speeches and presentations from our speakers are now available below for review.